In a word, "Why, it's spectacular!" The New Adventures of Winnie-the-Pooh is a Disney animated TV series in the style of the original The Many Adventures of Winnie the Pooh, the second Winnie-the-Pooh television series. It ran originally started on January 17, 1988 on The Disney Channel, moving to ABC's Saturday morning lineup in September of that same year and airing new episodes until October 26, 1991, while reruns aired until September 4, 1993 and again from December 9, 1995 until September 7, 2002, including a spot on Disney's One Saturday Morning and also on Disney's Playhouse Disney block. It also had a number of VHS releases and was also featured on a number of DVDs. The show also won the Daytime Emmy Award for Outstanding Animated Program twice (1989 and 1990). Despite ending its run after four seasons, the show was kept alive for over a decade after through package films consisting of footage from the show, along with standalone episodes making ideal extras for many video and DVD releases of later Pooh featurettes. Surprisingly for the source material, this was a somewhat Darker and Edgier installment by Pooh standards, with real villains and peril for Pooh and friends in some episodes. It's also noted for having the occasional Story Arc such as the story of Kessie. The show's recap page is under construction. Actionized Sequel: To an extent, some of the stories are more intense than previous Pooh features. Most notably this is the only interpretation of the franchise to occasionally use real villains (even if most of them are pretty low scale and nearly as hapless as Pooh). Actor Allusion: In "Sham Pooh," a mix up leads to all the characters acting like each other. Owl winds up thinking he's Pooh and acting like the real deal, which isn't too much of a stretch for his voice actor as Hal Smith was Pooh's voice actor as well in the early 1980's. Smith does do a pretty good job of differentiating his voice for Owl-as-Pooh compared to the regular one he used for Pooh. Adaptation Dye-Job: Rabbit's fur is a pale green color as opposed to yellow in all other Disney adaptations. Adult Fear: In "Find Her, Keep Her", Rabbit experiences this when Kessie nearly falls off a cliff to her death. In "Babysitter Blues", Kanga goes through this when Roo and Tigger's hide-and-seek game works too well. Amateur Film-Making Plot: "Pooh Oughta Be In Pictures" has Christopher Robin make a monster movie with the gang, with Piglet as the hero. Most of the episode, however, is about the antics Tigger gets into while stuck inside his monster costume (a giant carrot) and Piglet trying to overcome his fears. And Starring: When Paul Winchell was still a part of the series, he received the credit "And Paul Winchell as Tigger." Animation Bump: The Walt Disney Australia- and Tokyo Movie Shinsha-animated episodes. Also the Christmas Too special, which was animated at Walt Disney France. Artistic License  Physics: The episode "Cloud, Cloud Go Away" features not only a tangible cloud that apparently feels "softer than fluff", but also a climbable (or bounceable, in Tigger's case) rainbow that the cloud produces. Ascended Extra: Gopher was just brief comic relief in the Many Adventures segments. Here, he's a main character and receives more focus and screen time than Kanga, Roo, and Owl. Aside Comment: Tigger frequently does this with an accompanying glance to either the viewer, or the narrator. The episode "Babysitter Blues" had Christopher Robin, Pooh, Piglet, and Tigger being babysat by an unnamed babysitter who also appeared as The Faceless like Christopher Robin's mother. Later on in the episode, Christopher Robin has to babysit Roo while Kanga goes out into the Hundred Acre Wood. "Find Her, Keep Her" starts off looking like this, but it turns out to be a Parenting Episode. "The Bug Stops Here" is a more proper babysitting episode where Pooh looks out for Roo and Owl's cousin Dexter while Kanga and Owl go out for an afternoon. Balloonacy: Done in, well, "Balloonatics." Baths Are Fun: "The Old SwitcheRoo," based on earlier material, has Tigger and co. trying to help get Roo out of taking a bath because baths are "the end." Piglet ends up getting used as a substitute for Roo and being bathed by Kanga. But when Tigger and Roo get covered in mud and gum, they both end up in the bath. "Scrubbly bubbly." Tigger is forced to admit that when you take a bath "You get... you get clean" and Roo declares "This is fun!" Tigger was right about one thing, though... it was The End. (And the episode ends.) These events were later adapted for Piglet's Big Movie and the Carly Simon song "Mother's Intuition." Be the Ball: In the episode "Paw and Order," horse thief Nasty Jack shows Piglet the difference between bouncing and trouncing by turning another horse thief into a basketball... dribbling and shooting him into a hoop for good measure. Big Ball of Violence: One occurs with the angry toys in the store in Episode 13. Episode 15 had the two teams in a slightly different one while playing ice hockey. Rabbit does it twice in "Luck Amok," when Tigger pulls the plug in the bathtub, and Rabbit gets sucked down the drain and he sees his watermellons rolling down on him. Tigger says it in "Honey for a Bunny," when he tells Rabbit to duck from the boomerang after Rabbit imitates the swan. Rabbit says another in "Un-Valentine's Day", preceded by a Little "No" when Tigger opens the closet of used valentines. Borrowed Catchphrase: In one episode, Rabbit utters Christopher Robin's "Silly old bear." Box-and-Stick Trap: In "Where, Oh Where Has My Piglet Gone? ", Pooh tries to locate Rabbit's lost hammer by using one of these and setting out a bunch of nails as bait. The trap gets set off and when Pooh goes over to see what he caught, he finds that he caught a saw instead. Tigger: "Never mind the retreat, let's get out of here!!" Caged Inside a Monster: At the beginning of "There's No Camp Like Home", Piglet has a nightmare about being chased by heffalumps and woozles, ending with him being behind bars inside a police heffalump's stomach. Calling Card: The Pack Rats' gimmick of stealing things and leaving behind walnuts as "payment". Calvinball: It is not at all clear what the point of the game that they are playing in "What's the Score, Pooh?" is, or what even the basics of the game are. Cartoon Bug-Sprayer: Sometime wielded by Rabbit in his battles with the bugs that invade his garden. He wants one for Christmas in "Winnie the Pooh and Christmas, Too". Christmas Carolers: In the Christmas Episode Rabbit hears someone singing at his door and thinks they're carolers, but it's actually the vegetable eating bugs, trying to get into his kitchen. Christmas Episode: "Winnie the Pooh and Christmas, Too". There were also special episodes for New Year's Day, and Valentine's Day. Comically Missing the Point: Pooh does this often. 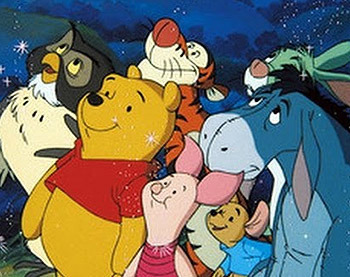 One episode says that Pooh is a pro at doing "nothing," a reference to the end of the film. Clothing Damage: The back of Pooh's shirt gets torn off at the end of "Gone with the Wind". Cool Car: Rabbit drives away in one of these (called the carrot ala cart) in a bad dream Piglet has. Counting Sheep: In the episode "Rock-a-Bye Pooh Bear", when Piglet is afraid to go to sleep, Pooh, Rabbit and Tigger try this on him by having Tigger bounce around dressed as a sheep. In the end, Tigger gets tired before Piglet does. Covered in Mud: Usually with Tigger (willingly) and often with Rabbit (to his dismay). Crazy Enough to Work: In "Things That Go Piglet in the Night," Tigger's plan to help Eeyore swing from the tree is to attach wooden wings and a parachute, and then launch him from another swing. Even Tigger is shocked that this works. Cultural Translation: Moreso than the original: Christopher Robin now had an American accent and lived in what looked like a typical US suburb — albeit one that seems to use the British street-numbering system. Darker and Edgier: Compared this one to the original featurettes, and more to the later movies and shows such as My Friends Tigger and Pooh this show has surprisingly many dark and scary moments, even if most of them have a distinct comical undertone. While it's all still thoroughly light hearted and cutesy, this is probably as Dark And Edgy as you'll ever see Winnie the Pooh, aside from Pooh's Grand Adventure, obviously. "Sorry, Wrong Slusher" is probably the darkest episode of the series. It takes place wholly at night, and the gang incurs the wrath of a very real threat when Tigger gives Christopher Robin's address to an angry man on the phone. The gang themselves realizes they've just given their location to a potentially very dangerous man and try to prepare for his attack. The escapade takes them outside to the surrounding neighborhood, where they create a disturbance in the neighbor's yard and the neighbor calls the police on them and has them arrested in a Gainax Ending. While thankfully a "slusher" (their word for a slasher murderer) didn't actually get their address, the episode is one of the most adult of the series and is extremely tense, dark, and filled with some nightmarishly real dangers. Dark Reprise: "There's No Camp Like Home" opens with Piglet in a scary version of "Heffalumps and Woozles" from Blustery Day. A Day in the Limelight: Nearly every supporting character gets at least two or three episodes where they are the main focus. Defeat Means Friendship: Villains aren't very common and often turn out friendly after all. Exceptions being Crud and Heff and Stan. Demoted to Extra: Kanga and Roo made sporadic appearances throughout Season One and then disappeared altogether besides a couple episodes. Christopher Robin, despite being a regular in Season One, also became a nominal cast member afterwards. Despair Event Horizon: In "Pooh Oughta Be in Pictures", Piglet of all characters almost crosses it after having been too scared to save Pooh from the mutant carrot (which turned out to only be Tigger in a costume). Piglet quickly snaps out of it when Pooh gets entangled in the tattered costume, and uses his "hero scarf" from earlier in the episode to come to Pooh's rescue. Disney Acid Sequence: "Eeyore's Tail Tale" has one starring Tigger the Private Ear chasing Eeyore's tail through a very trippy, cartoony city, including some classic cartoon chase-scene gags. Disproportionate Retribution: In "Up, Up and Awry", Winnie the Pooh is placed in house arrest for "breaking the law of gravity". Played for Laughs, of course. The episode "There's No Camp Like Home" opens with Piglet having a nightmare about being chased by heffalumps and woozles. "Rock-A-Bye Pooh" likewise opened with Piglet having a bad dream where he was going on a picnic with Pooh, Tigger, and Rabbit, only for the three of them to suddenly disappear in strange waysnote Tigger bounces into the sky and doesn't come back down, Rabbit drives off in a carrot-shaped go-kart, and Pooh climbs into his own honey pot and doesn't come back out, leaving poor Piglet all alone as a terrible thunderstorm approached. Piglet then woke up, but wound up afraid of going back to sleep. Drunk with Power: Rabbit and Tigger in "The Piglet Who Would Be King." While Piglet averts this as he doesn't even want to be the Piglies' king, Rabbit and Tigger let things go to their head as they act as his personal assistants. Tigger: Say, for a Big Bad Bunny, he's sure not being very bad. Rabbit: For once, you're right, Tigger. We have lost track of the story, haven't we? Rabbit: How can we play with missing pieces? Pooh: By playing the missing pieces. Tigger: Are my ears on too tight or is Fluff Boy making sense? Early Installment Weirdness: The first season featured several original songs, and also a penchant for ending the episode with Pooh reflecting on the story's events with Christopher Robin, ending with "silly old bear". The pilot episode also included such an ending, but with the camera panning out to replicate the final shot of the opening credits. Many Season One episodes were also far more surreal and experimental, utilizing one-shot antagonists and different backdrops such as fictional settings or Christopher Robin's suburban home, while the later episodes usually played closer to the laid back setup of the books and original film. Eat the Camera: Seen in "Invasion of the Pooh Snatcher", when Tigger explains that he must protect his friends from the "jagulars," he then growls right into the camera for no real reason except as a visual effect. Inverted by Tigger with "Rabbit Marks the Spot." The Eeyore: Guess who. Although in the episode "Donkey for a Day," after surviving his friends' attempts at cheering him up, Eeyore explains that he isn't really depressed. In fact, he's happy because he gets to watch the most breathtaking sunset ever seen. Eldritch Abomination: Crud from "Cleanliness is Next to Impossible", at least by this show's standards. Et Tu, Brute? : Rabbit's nightmare in "Rabbit Marks The Spot" which causes him to worry of losing his friends' trust when they found out that he hid rocks in the chest that he buried for them, even though their reaction is quite the opposite towards the end. Stone Piglet: It wasn't a nice thing to do, Rabbit! Stone Pooh: You built up all our hopes! Stone Tigger: You got us all excite-erated! Stone Gopher: And what'd we get, huh? A bunch of rocks! Rabbit: I'm sorry! It was just a joke! It was just a joke! A JOOOOOOOOOOKE!!! (wakes up from his nightmare) It was just a joke... just a... just a... Oh, my, it was just a bad dream! Everybody Cries: In "Party Poohper", Piglet invokes this trope onto Rabbit's 500 relatives by reading a Downer Ending version of "Jack and the Beanstalk". The rabbits cry so loudly that they end up shaking up Rabbit's house and causing a mess! Evil Counterpart: The three thuggish stuffed animals at the toy shop in "How Much is That Rabbit in the Window?" strongly resemble Pooh, Piglet, and Tigger. Rabbit: Happiness is seeing the benefits of good hard work. Ah... watching the things you planted with your own hands springing up fresh and green. And then.... MUAHAHAHAHAHA!!! HARVESTING THEM!!! Explain, Explain... Oh, Crap! : "No Rabbit's A Fortress": When Rabbit is finally fed up with Pooh, Piglet and Tigger messing up his garden, he builds a fortress around it, complete with booby traps, and harshly orders his friends to never bother him again. Unfortunately, he soon realizes that he has trapped himself inside the fortress! Rabbit: Now for a little peace and quiet... and gardening. Hmm. Where did I leave my shovel? Oh, yes, it's right outside THE DOOR?! (screams and panics) THE DOOR! I FORGOT TO MAKE A DOOR! I can't get out! I'M TRAPPED! DOOMED! The Faceless: Christopher Robin's mother. Whenever she appears, we only get to see the back of her head. Also the babysitter in "Babysitter Blues" and the store manager in "A Pooh Day Afternoon", though we get a brief glimpse of his face when Skippy the dog rushes past. Family-Friendly Firearms: In the Western themed episodes, characters would use ice cream scoopers in place of guns. Fool's Map: "Rabbit Marks The Spot" saw Pooh, Piglet, Tigger, and Gopher looking for buried treasure, with help from a fake treasure map that Rabbit had created. Forgotten Birthday: In "How Much Is That Rabbit in the Window? ", Rabbit thinks it's happened to him due to a complicated series of misunderstandings. Pooh (sticky with honey) accidentally pulls several pages off Rabbit's calendar, leading Rabbit to mistakenly believe it's his birthday and misinterpret his friends' activities as preparations for a surprise party. Angst ensues when he concludes they've forgotten, but fortunately there's a party on his actual birthday the next week. Frankenstein's Monster: "The Monster Frankenpooh" is a parody of this, with Piglet as Frankenstein, and Pooh as the monster. Funny Background Event: In "Donkey for a Day", there is a scene of Piglet going over a checklist of possible activities to make Eeyore happy. In the background, Eeyore is seen bouncing with Tigger and Roo, going higher and higher with each bounce and eventually clearing the treetops. The Monster Frankenpooh": This shorter episode revolves around Tigger making Piglets story a scary story, but Rabbit, Tigger, and Gopher assure Piglet that it was all imaginary. Only for a very large Pooh Bear to reveal himself in the house. "Rabbit Marks the Spot": Rabbit reveals that there was no pirates treasure... only for an actual pirate ghost to appear and scare the gang. "Sorry, Wrong Slusher": The group gets arrested by the police, only for it to appear to be a dream.. only for it to turn out to be real? The jury is still out on this one. Goldfish Poop Gang: The Packrats. Grand Finale: Winnie the Pooh and Christmas Too was the last official episode of the series, though many Direct-to-Video specials after shared the same cast and production values and even used clips and continuity from episodes of the show. Poetically the third Christmas Special A Very Merry Pooh Year and the final featurette to do so, reused Christmas Too. Nasty Jack in "Paw and Order" ends up becoming the sheriff. Also, Wooster in "The Great Honey Pot Robbery" learns to share. Heroic BSoD: Piglet goes into a depression when Pooh leaves him to deliver the letter to Santa in Christmas Too. Hollywood Tone-Deaf: Owl's problem in "Owl's Well That Ends Well". His hooting is beyond awful, and even gives the birds a headache. Honor Before Reason: In "Prize Piglet", Tigger, Rabbit, Eeyore, and Gopher get stuck in a swamp during a race. Owl, wanting to keep the race fair, refuses to help them, saying that whichever one he helps first would gain an unfair advantage. Human Ladder: Eeyore, Piglet, Tigger and Rabbit (listed from top to bottom) form this when attempting to reach the sky in the episode "Pooh Skies." The Hyena: In "The Piglet Who Would Be King", Tigger, Rabbit, and Piglet encounter an actual hyena on their way to the Land of Milk and Honey, who simply laughs when Rabbit asks for directions. I Just Want to Be You: Tigger tries to teach Eeyore how to be more cheerful. Eeyore interprets his lessons as "being just like Tigger", and soon he's painted himself in orange and black stripes and bouncing the others. Insomnia Episode: The episode "Rock-A-Bye Pooh" had Piglet unable to go to sleep, due to a bad dream that he had where he lost his friends while they were going on a picnic. Pooh, Rabbit, and Tigger then work hard using different methods to try to get Piglet to go back to sleep, but to no success, until a storm blows up to which Piglet's dream does sort of come to reality. Fortunately for him, he's reunited with his friends in the end and he is able to sleep at night again. I Owe You My Life: In "My Hero", Piglet "saves" Tigger from drowning in a puddle, and Tigger tries to "help" him with everything until Piglet begins trying to set up a situation where Tigger can "save" him. This leads to a chain of rescues by each of the cast, and the group ends up having to have a meeting to settle things due to so many rescues and life debts. Interspecies Adoption: In "Find Her, Keep Her," Rabbit becomes an adoptive parent to a baby bird. He turns out to be an Overprotective Dad. Jerk with a Heart of Gold: Most everyone agrees that Rabbit's a jerk, but he has several moments throughout the series and features where he's clearly a softy and a good friend in the long run. Joker Jury: The trial by balloons in "Balloonatics". Just Train Wrong: "The Good, the Bad and the Tigger" is full of this. It even provides the page quote. The tender seems to lack a water tank and Tigger can walk through the whole train even though it includes a boxcar. And the train does some physical impossibilities like braking so hard that the cars flip through the air and land back on the rails. After Pooh and Tigger rebuild the train, nothing it does should be possible. Then again, as Pooh put it, "It's a fantasy". Crud of "Cleanliness Is Next To Impossible" is a pretty comedic villain by normal standards, but placed in a Winnie The Pooh feature, he makes for a blatantly darker tone than most of the harmless affairs of the series. Similarly, Wooster, the gigantic Woozle from "The Great Honey Pot Robbery", is pretty frightening by the standards of the show, at least until his HeelFace Turn. The crows in "A Very, Very Large Animal" are much larger and more menacing than the very goofy and cartoony crows typically seen in the show. Lady Mondegreen: Used in-universe. Tigger's alter ego "The Masked Offender" (from a mishearing of "The Masked Avenger", the hero from a story Christopher Robin read to them). Leitmotif: Rabbit has his own theme, heard in many, many episodes throughout the series, usually played whenever he gets upset with another character. The theme can even be heard in episodes that do not feature Rabbit, such as "A Pooh Day Afternoon". Let's Get Out of Here: During "Pooh Moon" episode, Rabbit suggests a strategic retreat from an (imagined) danger. Tigger: Never mind the retreat, let's get out of here!! Literal Metaphor: In "Sorry, Wrong Slusher", after being apprehended by the police and interrogated individually, the slightly off-camera judge rules to Pooh, Tigger, Piglet, and Eeyore, "I find you guilty of first degree causing noise! And I'm throwing the book at you! ", and throws an actual book at them, just missing them a few inches, to which Pooh replies, "It's too bad I can't read". Living Toys: The cast, minus Christopher Robin and sundry antagonists are living plushies; as per the book. The episode "Monkey See, Monkey Do Better" featured an obnoxious clockwork gorilla in a blue three-piece-suit and matching top hat Chris was set to receive for his birthday. Loophole Abuse: In "Sorry, Wrong Slusher", Christopher Robin's mom tells him to not let his head leave his pillow. Christopher then straps his pillow to his head and sneaks downstairs, because, as he says, "She said for my head not to leave the pillow, but she never said anything about the pillow leaving the bed!" Lost Voice Plot: Happens to Tigger In Tigger Got Your Tongue, when he loses his voice and becomes silent for most of the episode after it is claimed to be stolen by nobodies. Malaproper: Mostly Tigger, but occasionally other characters too, such as Pooh. Tigger is the origin of this, at least in Winnie the Pooh. Heffalump, Woozle, Gabloon, Animule, anything except Jagular which Pooh came up with. Magic Feather: In "Magic Earmuffs", Christopher Robin gives Piglet the titular pair of earmuffs so that he could ice-skate. Piglet loses the earmuffs, and believes that he cannot skate without them...until his friends are in danger. Naturally, Piglet saves the day, even without the "magic." Most Common Card Game: A group of "horse thieves" (actual horses) in "Paw and Order". Lampshaded in regards to Nasty Jack. When Rabbit disappears in one of Gopher's many dynamite explosions and a search of the area fails to turn up any sign of hide nor bunny, Tigger states glumly, "We're just gonna have to face it! Bunny-Boy is gone." (He turns up immediately afterward dangling from a high branch in a tree). Subverted by Eeyore in "Donkey For A Day": "Even though you almost killed me." Ninja Pirate Zombie Robot: When you hear about "horse thieves", you'd expect thieves who steal horses instead of thieves who are horses. No Celebrities Were Harmed: Anyone familiar with Jack Nicholson would be able to tell immediately who Nasty Jack in "Paw and Order" was based on not just in name and voice but even in his physical resemblance. Noir Episode: In Eeyore's Tail Tale, Tigger takes the role of 'Private Ear' to investigate the mystery of Eeyore's missing tail, complete with Private Eye Monologue and black-and-white scenes. Non-Fatal Explosions: Gopher's dynamite causes plenty of property damage, but the characters emerge from the same explosions unharmed. Noodle Incident: In The Bug Stops Here, Tigger, Rabbit, and Piglet go off to try and catch a bug. When Pooh and the others find them in a place set off with traps, the three of them are caught in a net suspended in the air, with no explanation of what happened. Normal Fish in a Tiny Pond: Most of the antagonists are petty bumblers, and in any other cartoon would likely be a Harmless Villain at best. Within the defanged Pooh universe however, they almost look fearsome. Nuke 'em: Believe it or not, suggested by Gopher as an option for getting Rabbit out of a tree in "No Rabbit's a Fortress"
Gopher: Well, in that case, I just have to use dynamite again. Like my daddy always used to say, "What gets blown up must get blown down." Rabbit: No! No! Not dynamite again! Gopher: You're right! Better make it nitroglycerin. Wait, how about U-235! Off the Rails: Very subtly done in "Paw And Order," involving a Western play; Sheriff Piglet is supposed to be rescued from Nasty Jack by the Masked Bear and his Faithful Steed (Pooh and Eeyore), but Jack simply steps out of the way of their dramatic charge. Gopher: Oops. Looked like they *whistle* missed. Tigger: That's not in the play! It's never stated outright, but the subtext here is that Jack, as an actor, had really wanted the Sheriff role but was denied it, so he's now taking his villain role very personally and wants to trounce Sheriff Piglet for real as payback for not getting the part he wanted. This makes his actions at the climax, and lines like "I *HATE* sheriffs!" from earlier and "I always wanted to be Sheriff" when he's given the badge in the end, take on a more significant meaning. Oh, Crap! : In "Donkey for a Day", Eeyore, after eating too many apples, registers a look of pure horror when Pooh reminds him that they still have lunch and dinner to go. Whenever Pooh's signature "Oh, bother" phrase is said, it's typically in one such moment. Or My Name Isn't...: At least two episodes had Pooh say, "...or my name isn't Winnie the Pooh! Which it is..."
One episode had Tigger say, "Or my name isn't T-I-double-'guh'-er! TIGGER! Which, by the way, it is!" Out-of-Character Moment: In "The Piglet Who Would Be King", Rabbit is friendly with Tigger and enthusiastic about going on a journey with him and Piglet. Normally, he would try to keep himself out of these journeys, especially if Tigger's involved. Parrot Expo-WHAT? : In Monkey See, Monkey Do Better, Rabbit challenges toy ape Bruno to gardening. Rabbit: How are you at horticulture? Paper-Thin Disguise: Pooh's disguise as the Masked Bear was just a mask. Possibly justified by being part of a Show Within a Show. In the Christmas special, Pooh dresses up as Santa Claus. Despite his costume only consisting of a fake white beard over his trademark red t-shirt that still exposes his round yellow tummy, it somehow manages to convince all his friends (especially Tigger). Performance Anxiety: Piglet in "Un-Valentines Day"
Pirate Song: There was a Pirate themed episode with the Pooh Pirates opening with the song "Pirates is What We'll Be". Portable Hole: "Bubble Trouble" reveals the entrance of Gopher's tunnel home as one of those. Precision-Guided Boomerang: Used as a Running Gag in the episode "Hunny for a Bunny". "DUCK!!" Priceless Ming Vase / It's Going Down: Continuing a running gag from the various specials. Rabbit's home is very immaculate and ordered, and he is the only person in the wood who owns things like ornate plates and furniture, expensive looking jars and other bits of finery. Naturally, his house it wrecked nearly every time we see the inside of it. Lampshaded in "Gone With The Wind." Rabbit (buried under a pile of his ruined furniture and dishes): "Why does this always happen to me?" "The Masked Offender" subverts this with Tigger swiping a table cloth that's got Piglet's fine china on it. They manage to land back on the table without a scratch, causing Tigger to remark "Thought they were all going to crash, didn't ya?". Then it's double subverted, as they crash anyway due to the vibration of Tigger slamming the closet door. The Promised Land: The Land Of Milk and Honey. Put On The Bus: Kanga and Roo disappeared from the show after the Season Three episode "The Bug Stops Here", and actually kept absent from the Pooh franchise altogether for almost a decade afterwards (they returned in the wraparounds for Seasons of Giving, which was a New Adventures compilation film). Raincoat of Horror: In "Pooh Oughta Be in Pictures", Piglet (who has been struggling with fear the whole episode) gets spooked by a shadowy figure wearing a raincoat, which turns out to be Pooh. This scene is also shown in the theme song. Real After All: Prior to this series, Heffalumps and Woozles were merely creatures of Pooh and the others' imagination in both the original books and Disney features. Starting from New Adventures they begin appearing in person, usually as bumbling antagonists. Rearrange the Song: The same theme was used throughout the series, however Season Two onwards rerecorded it with a slightly different instrumentation. The theme everyone is familiar is actually the rerecorded version. here's the original Curiously the ending credits, which played a short orchestral version of the theme in Season One, were lengthened to play a full mostly instrumental edit of the opening theme proper, subverting the trope. Replaced the Theme Tune: The Growing Up with Pooh (The Magical World of Winnie the Pooh in the UK) DVD releases of the series do use a different intro and theme however. Rhyming List: In "All's Well That Ends Wishing Well", Tigger makes a rhyming list of all of his birthday wishes, notably "banana splits and pogo sticks". Runaway Train: The basis for the fantasy sequence in "The Good, The Bad and the Tigger." The Runt at the End: "The Piglet Who Would Be King" had a herd of heffalumps thunder past, followed by a tiny heffalump chanting "The land of milk and honey! The land of milk and honey! Hooray!" Sanity Slippage: Rabbit, very quickly, when he first starts taking care of Kessie, giggling and making faces like maniac and babbling about having carrots to take care of. He snaps out of it before long, though. He has another one in "Honey for a Bunny" when he learns the mate to his bookend was actually the same one he dumped. Rabbit has a third one in "Fish Out of Water". After all the trouble of having Gopher as a house guest and trying to get his home back from the muttonhead trout, the thought of it happening again when the muttonhead trout swim back downstream was too much for poor Rabbit's mind to handle; he literally jumps in and starts swimming upstream with the muttonhead trout to get away from it all. Scooby-Dooby Doors: Part of the Disney Acid Sequence in "Eeyore's Tall Tail." Schmuck Bait: In "No Rabbit's A Fortress" Tigger spies an incredibly obvious decoy of Rabbit, and mistaking it for the real deal, bounces on it. When Tigger sees that it's a fake, he just can't believe he just fell for the oldest trick in the book! Tigger: Quiet, fellas! It's Long-ears! I'm comin' for ya, Bunny-boy! (bounces on the dummy) Wait a minute! This isn't Rabbit! I've been boobied! Security Cling: There are three examples of this in the episode "Lights Out." First, Gopher jumps on Tigger's head at the mere mention of the word "dark." Later in the tunnel, Tigger jumps on Pooh when he hears a noise. And lastly, Tigger jumps into Rabbit's arms who in turn jumps on Pooh. Sesquipedalian Loquaciousness: Owl talks like this, and his cousin Dexter takes this Up to Eleven. "Trap as Trap Can" is this for "There's No Camp Like Home". "The Rats Who Came to Dinner" and "Oh, Bottle" are these for "Nothing but the Tooth". "A Bird in the Hand" is a follow-up to both "Find Her, Keep Her" and "The Great Honey Pot Robbery". Shout-Out: In "Rabbit Takes a Holiday", the others manage to completely destroy Rabbit's home and garden while he's away, so they erect huge murals depicting them in pristine condition to try to fool him. Sound familiar? Shown Their Work: Though more directly based on the Disney featurettes, occasional episodes make references to story material from the original A.A. Milne novels. In "The Big Switcheroo", for example, Tigger switches Piglet with Roo inside Kanga's pouch so Roo can avoid getting a bath (this story would again be adapted for part of Piglet's Big Movie), while in "Eeyore's Tail Tale" Owl mistakes Eeyore's tail for a door bell (this story would again also be adapted for part of the 2011 Winnie The Pooh film). Skewed Priorities: Pooh, after Tigger sadly walks away in "Luck Amok". Pooh: We can't let him leave, not for seven years! He'll miss my birthday. Sneeze of Doom: In "There's No Camp Like Home", a family of heffalumps are introduced with the papa Heffalump being allergic to pretty much anything, such as deep dark pits, heights and "furry woodland creatures". He lets out a mighty sneeze once someone reminds him about his allergies. Spit Take: Piglet does this in "My Hero" during a meeting on who saved what, when Owl mentions Tigger is still Piglet's servant. Rabbit is by far the most fleshed out member of the cast. He has the most spotlight episodes, despite the fact he tends to not get as much advertising as the other four main characters (Pooh, Piglet, Tigger, and Eeyore). Additionally, much of the series seems to center around Rabbits house as a sort of general home base for the Hundred Acre Wood characters. Gopher also counts, as this series greatly increased his prominence to the point where hes easily the sixth main character - and usually eclipses Eeyore. Rabbit: Sometimes, Pooh Bear, you really amaze me. Superstition Episode: In "Luck Amok", Tigger breaks a mirror in Rabbit's home, and Rabbit tells him that means seven years bad luck. Tigger dismisses it, as it wasn't his mirror that broke, and he tries to help Rabbit avoid bad luck, which just results in Rabbit getting one misfortune after another. Eventually, it's revealed that the mirror belonged to Pooh, so Tigger tries to help him avoid bad luck, with the same results. Eventually, after everyone but Tigger suffers from bad luck, it become apparent that Tigger is the one who is unlucky, so he's cast out. The others feel sorry for him and reverse the bad luck by "fixing" the mirror (taping a picture of Tigger so that he thinks it's his reflection). In "Goodbye, Mr. Pooh," Winnie the Pooh's friends throw him one because they think he's moving away. Because of it, he actually does move away, but soon returns, only to find his house taken by Eeyore. As a result of a screw-up involving his calendar, Rabbit thinks he's about to be thrown one in "How Much Is That Rabbit In The Window?". He's sorely disappointed when he realizes otherwise. Survival Mantra: Subverted in "A Knight to Remember" with Piglet chanting "I am not brave, I am not brave..."
Suspiciously Specific Denial: No one in the Hundred Acre Wood is sending valentines. Talking the Monster to Death: Pooh tries this with the giant Woozle at the end of "The Great Honey Pot Robbery," and Piglet tries this with Nasty Jack at the end of "Paw and Order." Being part of the most idealistic franchise Disney owns, it works. Termite Trouble: The main conflict of "Tigger's Houseguest", wherein Tigger "befriends" a termite that's been ravaging the Hundred-Acre Wood. Terse Talker: Gopher's Grandpappy talks like this most of the time, usually only saying either, "Yup," or, "Nope." Third-Person Person: Kessie, but only right when she's introduced. She seems to pick up the use of pronouns very quickly. Unexpectedly Dark Episode: The fourth episode, "Find Her, Keep Her", while not particularly dark, has a Bittersweet Ending and is far more emotionally complex than any other episode of the show, or any animated show at the time, for that matter. Unwanted Assistance: invoked Eeyore went through this when everyone tried to cheer him up in "Donkey For A Day". Vile Villain, Saccharine Show: With the literally "vile villain" being Crud from the episode Cleanliness Is Next To Impossible. In the fourth and final season, Christopher Robin's voice was noticeably lower, due to the boy that was voicing him getting older. Hal Smith (Owl), Paul Winchell (Tigger) and John Feidler (Piglet) all return to reprise their roles from the original film, though obviously their voices have worn down slightly within the two decades that have passed. Winchell in particular sounds far more high-pitched and raspy as Tigger. A few replacement actors that became mainstays also sound rather different here, (Ken Sansom's Rabbit and Peter Cullen's Eeyore in particular) having not fully mastered the voices yet, especially in earlier episodes, where Sansom's Rabbit voice was gruffer and less effeminate sounding and Cullen's Eeyore was higher-pitched and less breathy. Similarly Jim Cummings starts filling in for Winchell as Tigger midway through the series, and the difference between the two takes is more noticeable here. "Pooh Skies" where Tigger is jumping on a trampoline and falls on Rabbit. The Western: "Paw and Order" and "The Good, The Bad, and the Tigger". Wishing Well: In "All's Well That Ends Wishing Well", Tigger drops a penny in a wishing well, but is disappointed when he doesn't get what he wished for at his birthday party. Later, everyone goes down the well and end up in Wishland, where all of Tigger's wishes come true. Your Other Left: In "A Pooh Day Afternoon", Gopher says, "Right! No, your other right! ".